Students and young people drink beer in the vicinity of the Vietnam National University-Ho Chi Minh City in Thu Duc District. “It will surely be a big disadvantage for your job and business if you can’t drink beer or wine,” Nguyen Thi Hai Yen, a female student, said. “If you can’t drink much, try to drink a little initially. This is a common point of view among many students and young people, white- and blue-collar workers alike, now in Vietnam, a country with almost 90 million people who drink over three billion liters of beer and around a billion liters of unregistered home-made alcohol each year. Many young office workers and students admitted that drinking beer and wine is an indispensable pleasure in their life, or a way to kill time or to relieve their boredom. It is that way of thinking that causes beer restaurants to mushroom on streets, especially around universities and industrial parks in the Southeast Asian nation. A small street of around 100m in length near the Vietnam National University - Ho Chi Minh City accommodates around ten beer restaurants. The newly-built Pham Van Dong Boulevard in Ho Chi Minh City is called the “beer avenue” with many beer restaurants busy from 5:00 pm till midnight. A survey on beer drinking among students and young people in Vietnam carried out by the Ho Chi Minh City University of Education in 2014 showed that many people start drinking at an early age and have inappropriate views on beer drinking. The survey was targeted at 670 young men, including 470 in Ho Chi Minh City and 200 in the central region. Sixty percent of those polled in the survey were students and the remaining were young adults. This represents a kind of ‘drinking culture’ among Vietnamese people, especially the young, said Doctor Huynh Van Son, head of the psychology department at the said education university. Many of the respondents agreed that drinking is to show they are adults and to ease negative feelings, stress and sorrow. Many thought that beer and wine are indispensable in social interaction in the future. Mai My Hanh, a lecturer of the psychology department at the education university who was among the people to conduct the survey, said many young people seem to have deviant viewpoints on beer and wine consumption. They said that they do not agree with any ban on beer and wine drinking, and that they do not care about the complaints of others against their alcoholic consumption, Hanh said. Some even divulged they are willing to steal or borrow money to buy beer for drinking, she added. Facing a situation that they would have to present a report or give a lecture the following day and they are invited by friends to drink beer, nearly 41 percent replied that they would focus on their work and put aside the invitation. But 59 percent chose to accept the invite and go out with their friends. In another scenario that the respondents drink some beer at work and get warned by others, over 54 percent said they would accept the warning and stop drinking immediately while 46 percent claimed to try to drink some more. A survey on the drinking practice of 470 young people in Ho Chi Minh City showed that 38 percent often drink beer, over 21 percent are inclined to abuse beer and wine, and nearly 41 percent are addicted to drinking at different levels. Young women like drinking beer and wine as well. Vu Thi Huyen Trang, a 22-year-old student, admitted that she usually drinks at birthday parties and get-togethers with friends. “I can drink several bottles of beer just for fun,” Trang said. Truong Thi Thu, another student, said women must drink equally with men at parties but they should be able to control themselves. Bui Anh Vinh, another student, said, “Drinking is merely a way to have fun after work and studies. Phan Chi Tinh, a waiter at a beer restaurant in Thu Duc District, Ho Chi Minh City told Tuoi Tre (Youth) newspaper that his eatery is always crowded with students and young workers, many still in their school uniforms. They sing and talk loudly while imbibing beer, Tinh said. 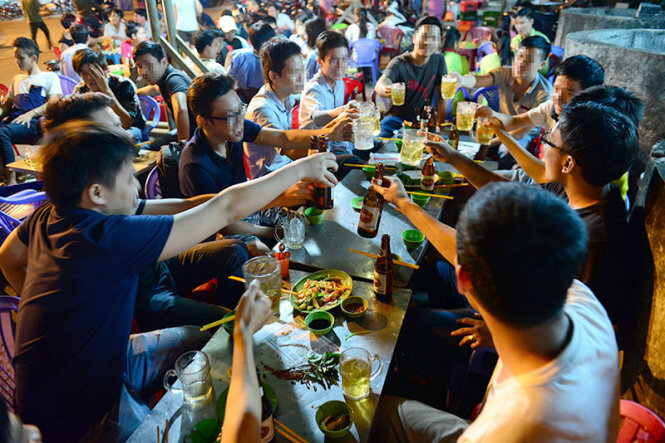 Doctor Son, from the Ho Chi Minh City University of Education, said 33.5 percent of Vietnamese people do drink beer and wine and 18 percent overuse alcoholic beverages. Statistics indicated that one-third of drinkers start drinking before 20 while 34 percent down beer when they are 14-17 and 57 percent get into the habit of drinking at 18-21.